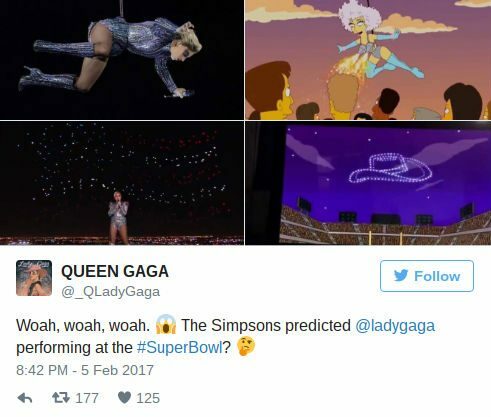 FACT CHECK: Did 'The Simpsons' Predict Lady Gaga at Super Bowl LI? 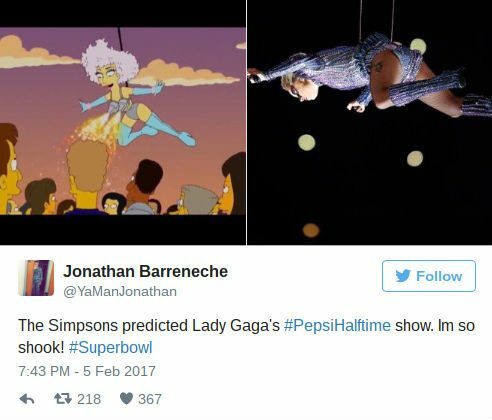 Did ‘The Simpsons’ Predict Lady Gaga at Super Bowl LI? 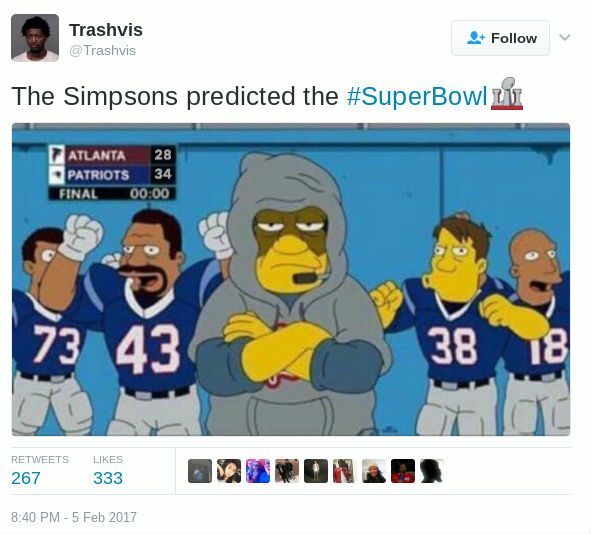 According to rumors, the animated series made several predictions that came true during the 2017 Super Bowl game. 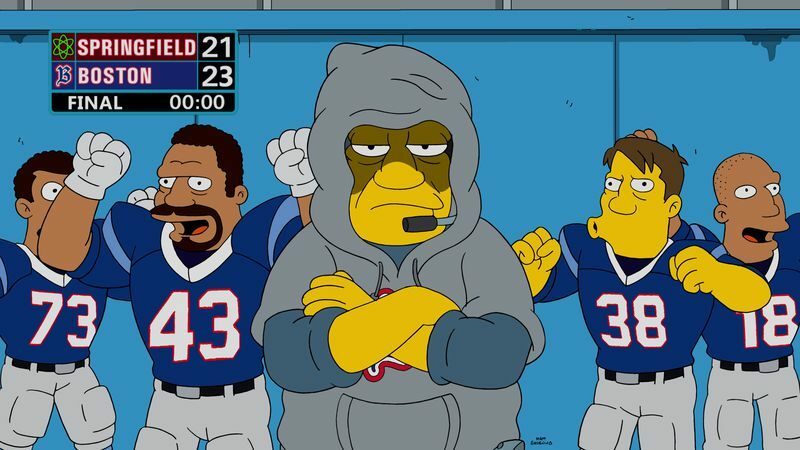 The Simpsons correctly predicted various incidents that took place during Super Bowl LI. At least one scene from an episode of The Simpsons appeared to predict pop star Lady Gaga's halftime show during the 2017 Super Bowl. A few images showcasing these "predictions" from The Simpsons were either doctored or came from unrelated episodes. Of course, there are a few problems with this prediction. For example, “The Simpsons” version of Lady Gaga was not performing at the Super Bowl. Also, as with other predictions from “The Simpsons,” the show was actually spoofing a previous event, not attempting to predict a future one. The cowboy hat in the bottom right corner of the graphic did not come from the same episode of “The Simpsons,” but in one from 2005 called “Homer and Ned’s Hail Mary Pass” in which characters Homer Simpson and Ned Flanders planned a Super Bowl halftime show. The cowboy hat image is real, as are the fireworks — but but fireworks were invented long before they appeared on that 2005 episode. Additionally, Lady Gaga’s show did not feature a giant cowboy hat, and the lights display at Super Bowl LI was created with drones (filmed earlier in the week) rather than fireworks. 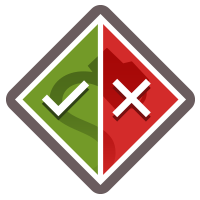 As spooky as the predictions may seem at first glance, a closer look shows that it they are actually nothing more than a combination of digital manipulation, wishful thinking, and keen observations. The Verge. 5 February 2017.